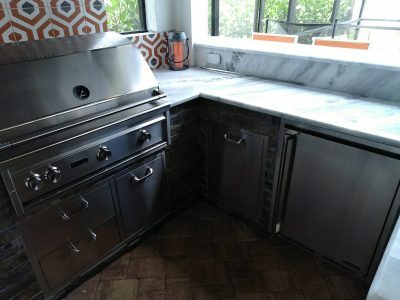 This was only a two year old kitchen that we ripped out and replaced with our own. 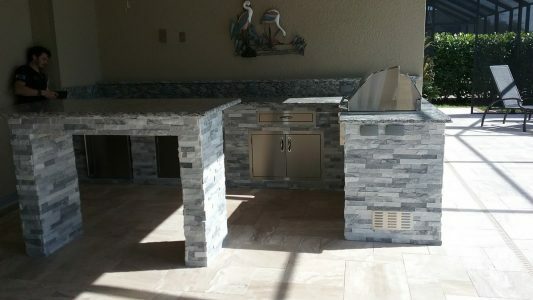 Comes complete with a Summerset Grill, trash slide, 2-drawer refrigerator and custom pergola above. Before: We ripped out the old kitchen to make way for the new. Here, we blocked in what was once a screened area, stuccoed the wall and added our kitchen, along with a custom tile backsplash. 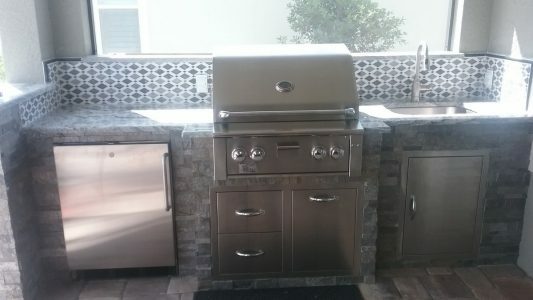 For appliances, this unit features a Lynx grill, side burner and fridge. 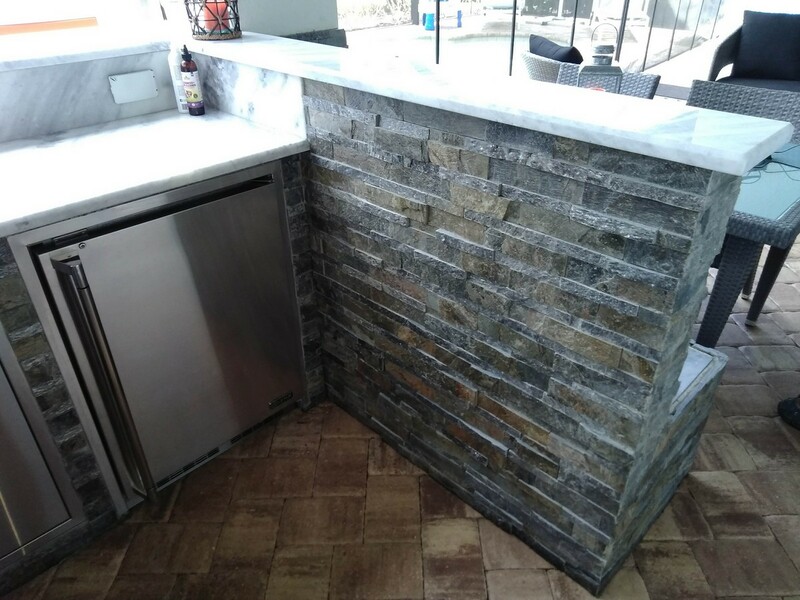 Another focal point is the custom Quartzite counters, and we also added a storage bench, seamlessly integrated into the half wall. 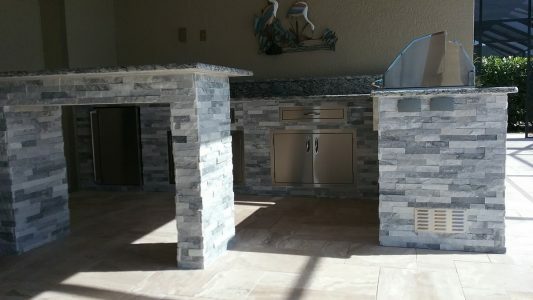 We even removed the window bands and matched the ceiling tongue and groove on them. 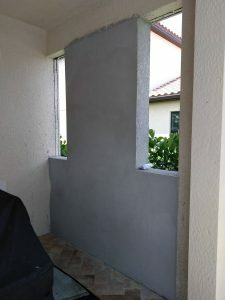 This used to be a screened area, which we blocked in. Here's the finished kitchen, with a custom tile backsplash on our newly blocked in wall. 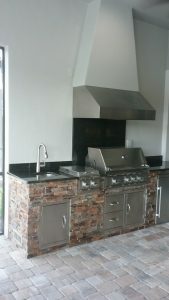 Deluxe appliances and custom Quartzite countertops. 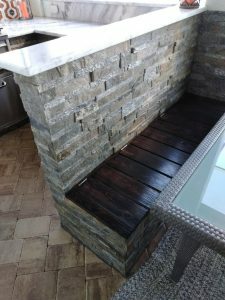 The bench on the opposite side of the half wall. Serves as both seating and storage. This kitchen brings on the tropical vibes with a custom bamboo backsplash fence complete with lights for after dark grilling parties. 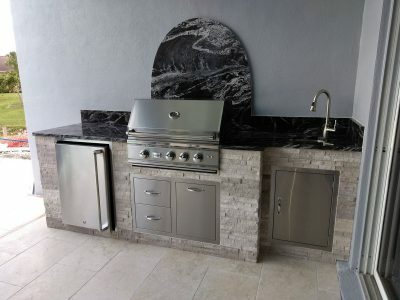 The full range of appliances include a Lynx pizza oven, Summerset grill, a side burner and a two drawer fridge. 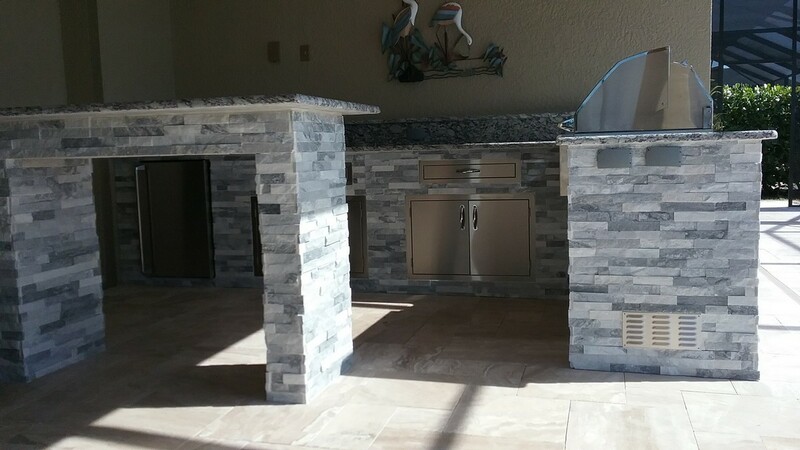 Tons of counter space make entertaining a breeze. We worked on this unit until one o’clock in the morning to fulfill the customer’s needs on a tight deadline. This Fort Myers customer requested a round, granite backsplash. 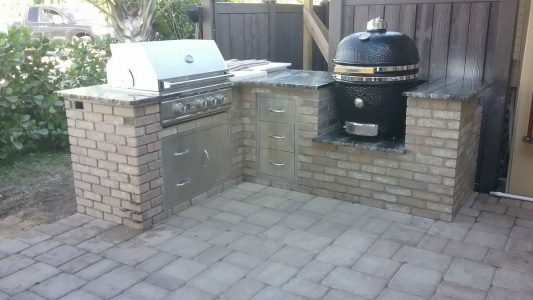 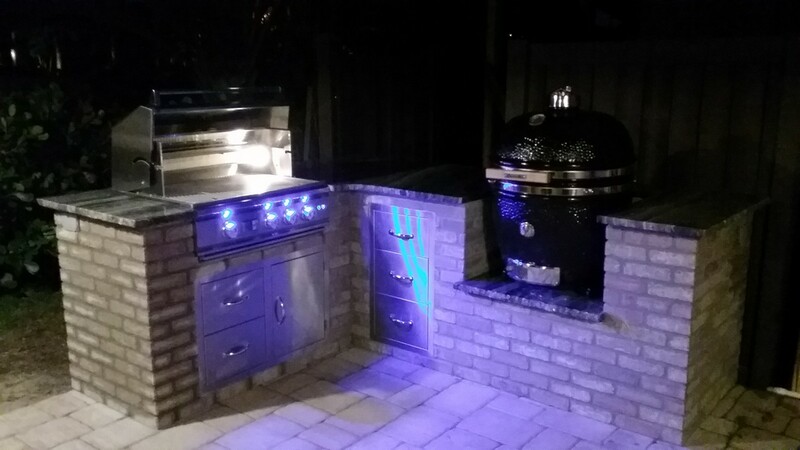 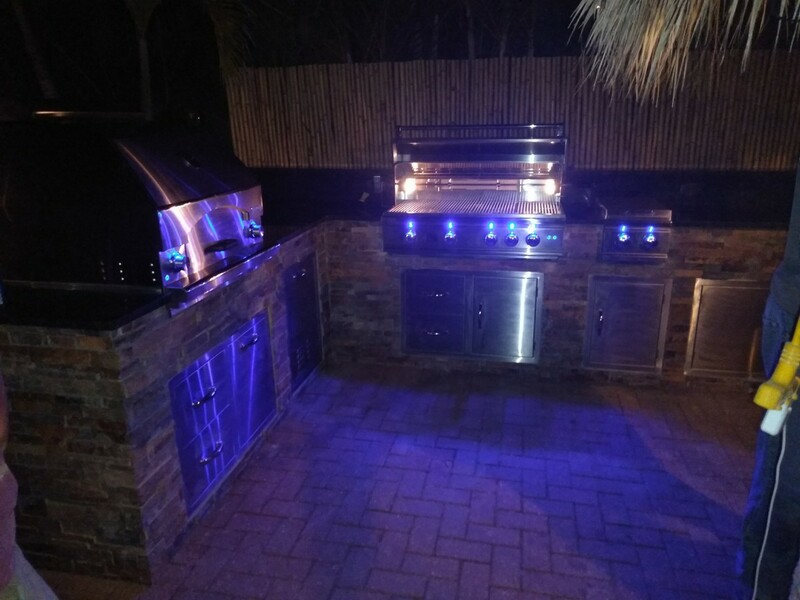 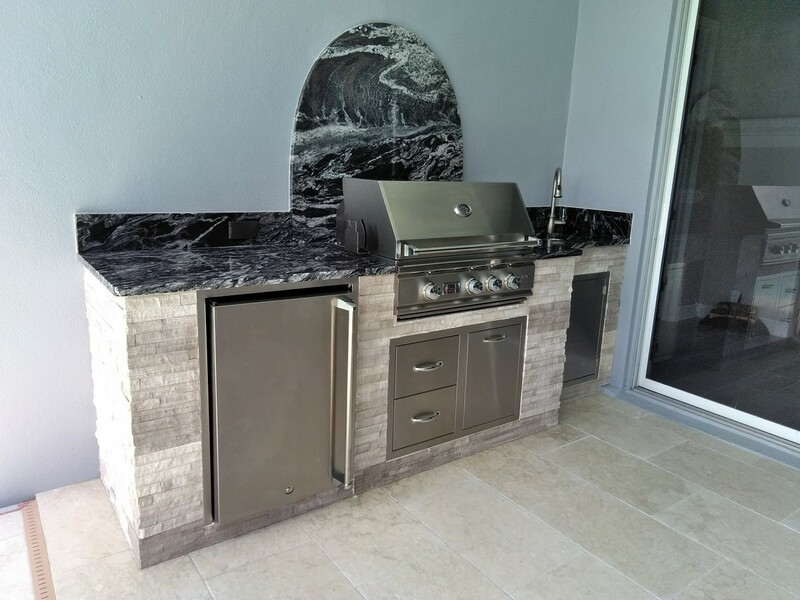 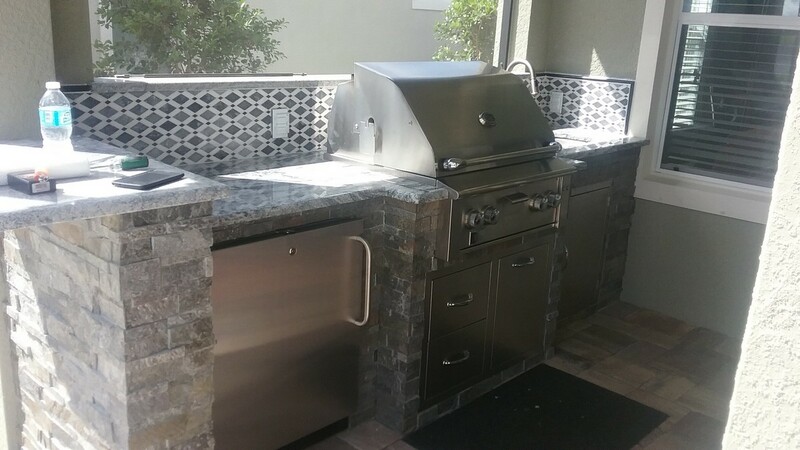 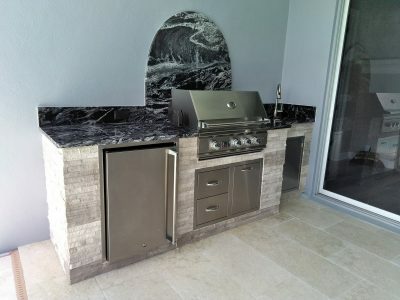 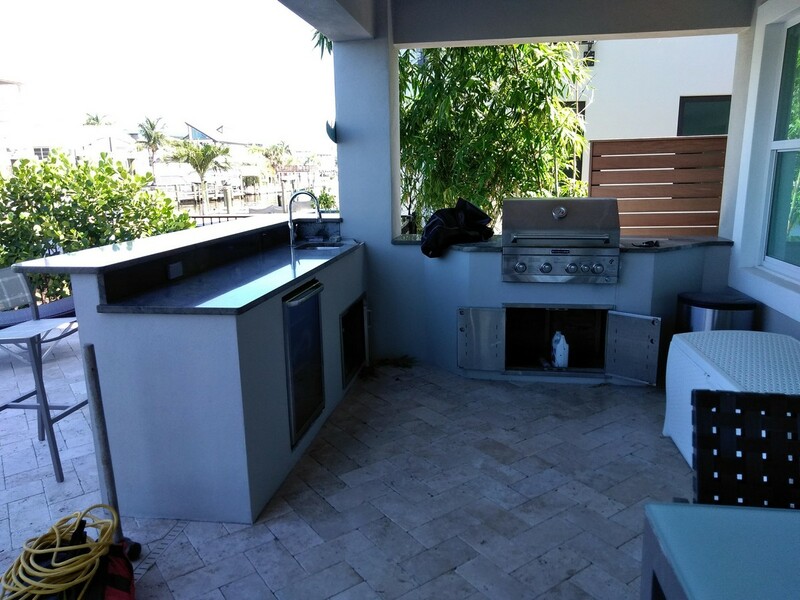 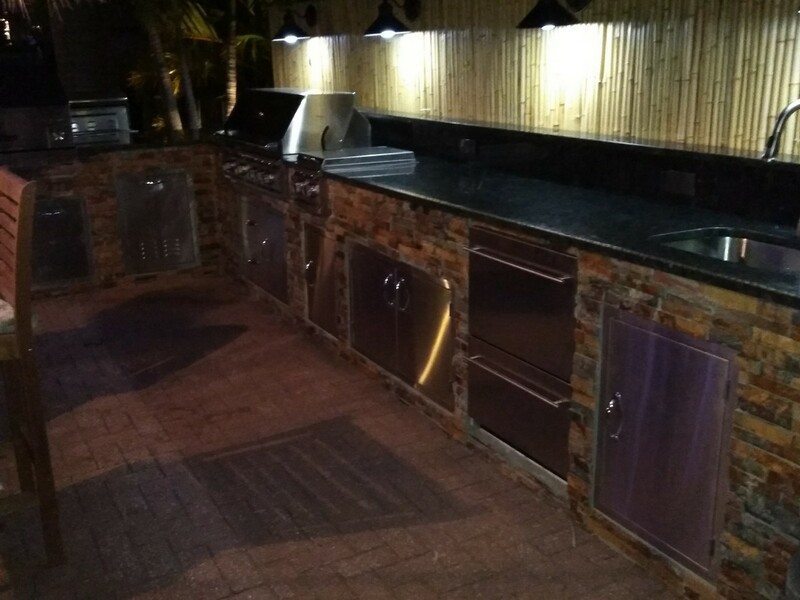 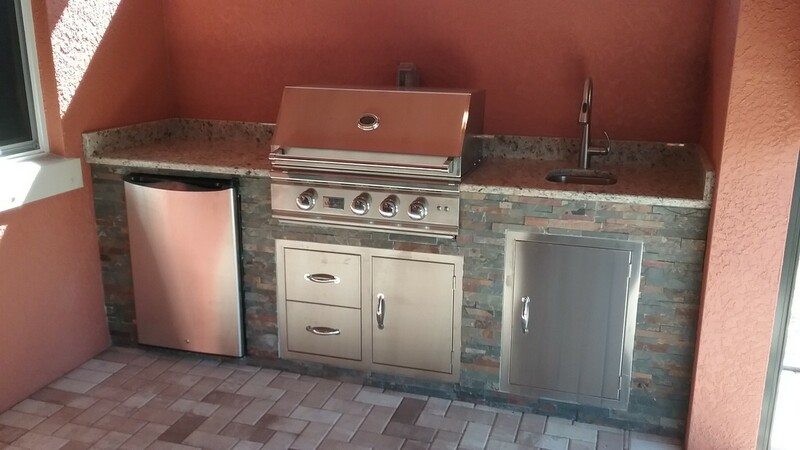 The finished outdoor grilling area features Summerset appliances. 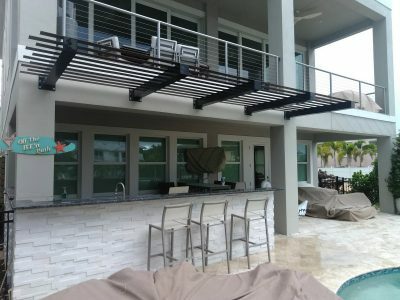 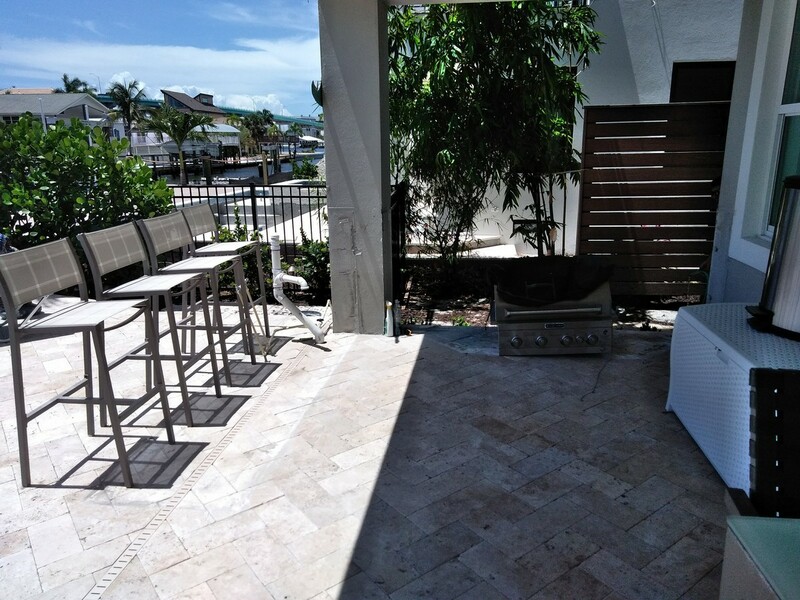 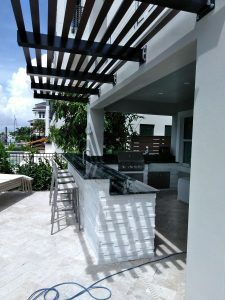 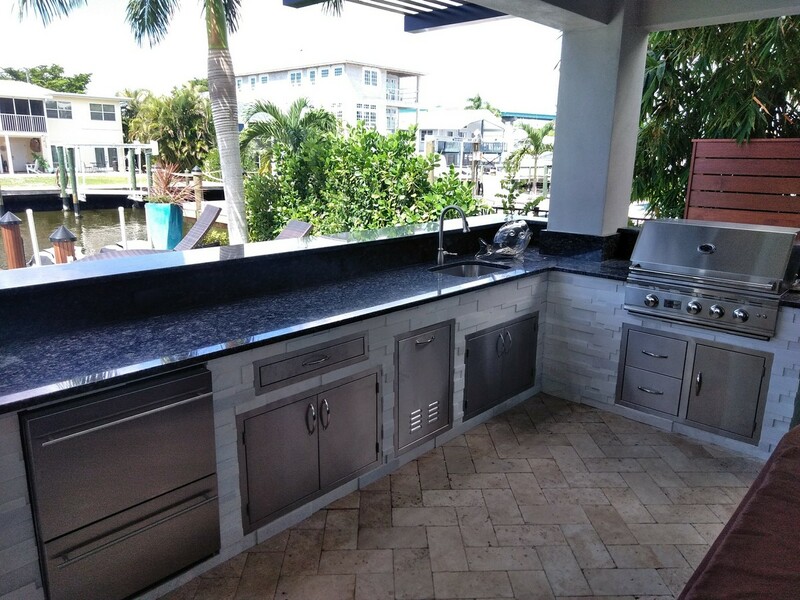 At this Fort Myers home, we designed and installed a posh poolside barbecue area. 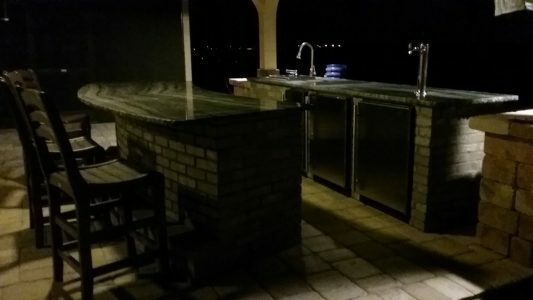 The bar / island presented a challenge. We had to carefully remove the travertine and custom make augers to which we attached the bar for support. Other features include a Lynx grill, a built up backsplash to hide the electric, and under counter lights. 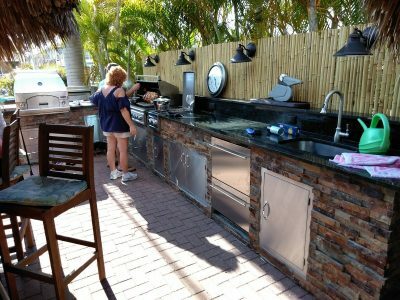 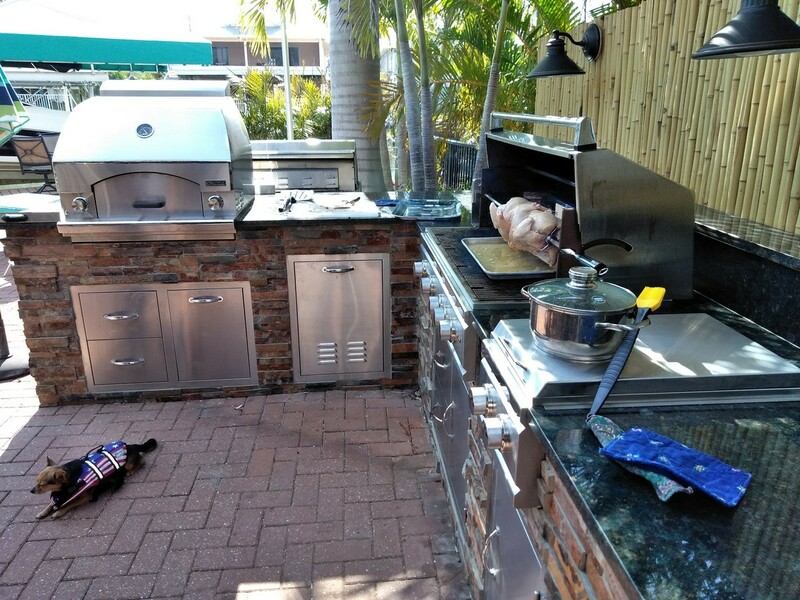 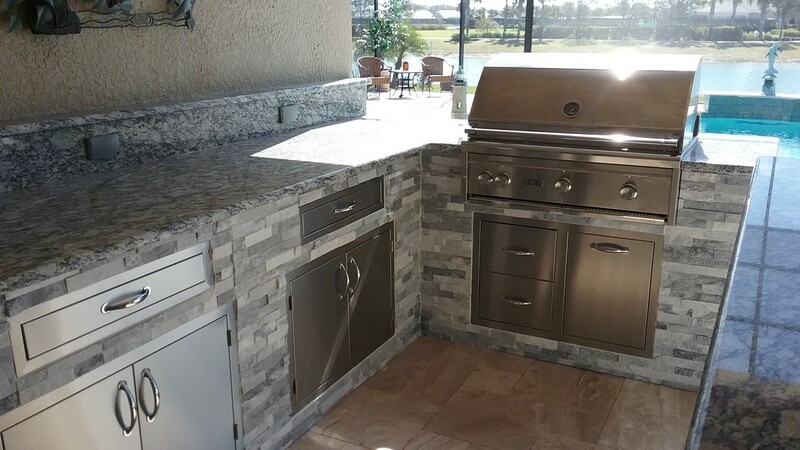 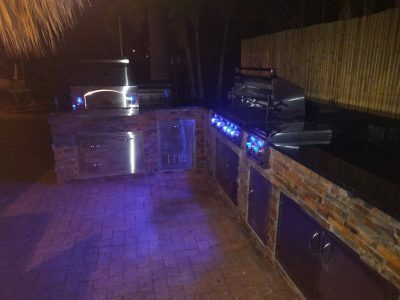 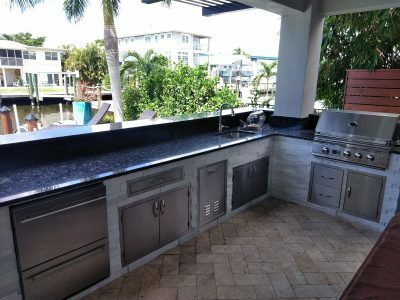 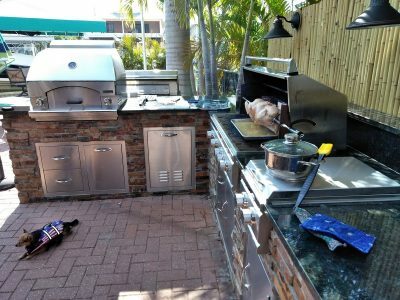 This outdoor kitchen in Fort Myers has all the bells and whistles. 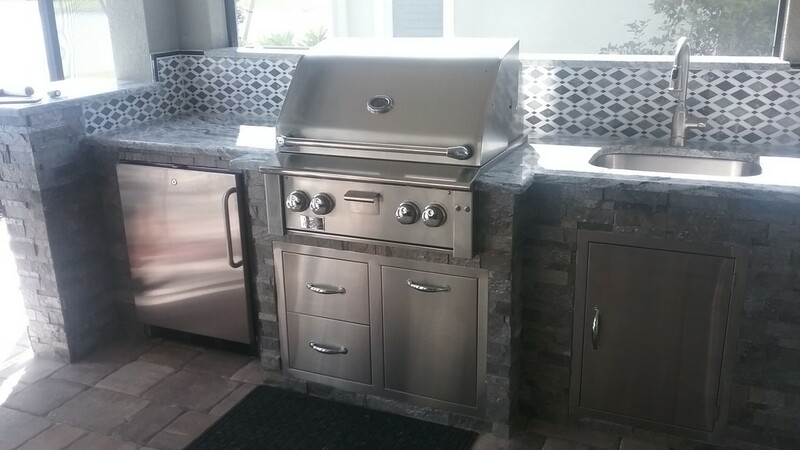 It features a Summerset TRL grill, a triple drawer for wood/charcoal storage to feed the 23″ Saffire black smoker. 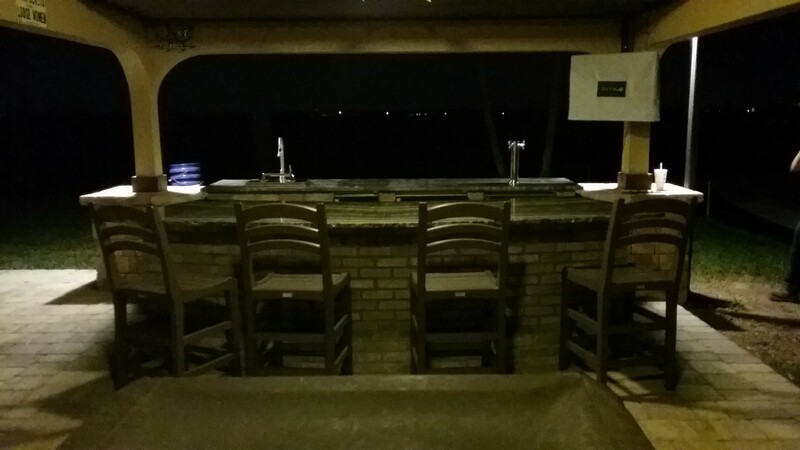 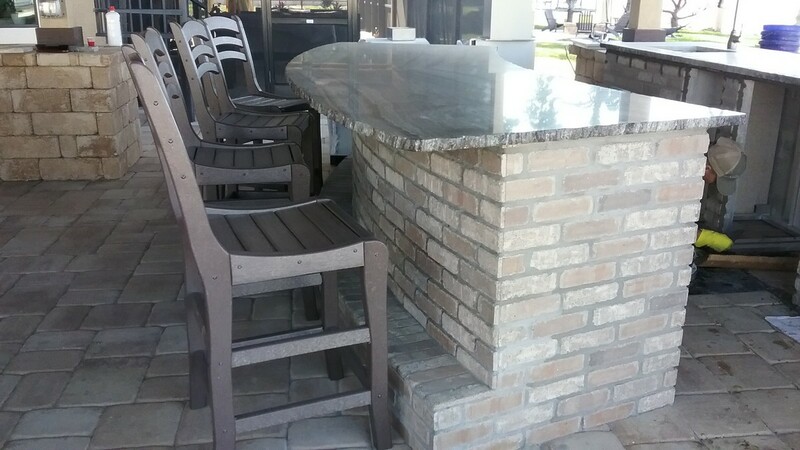 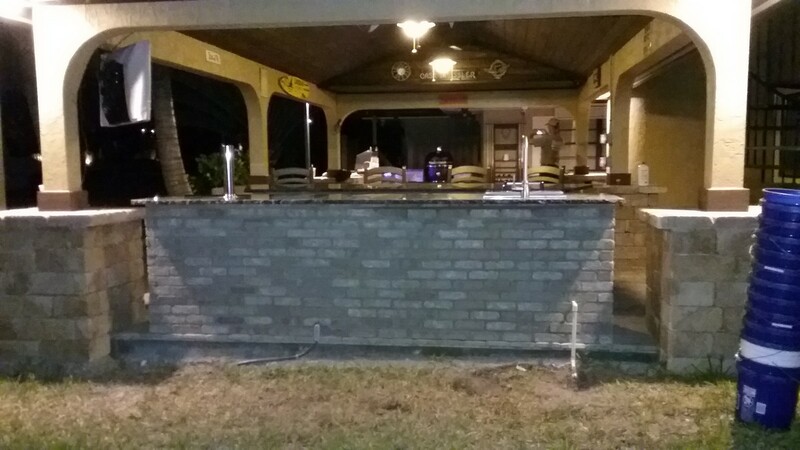 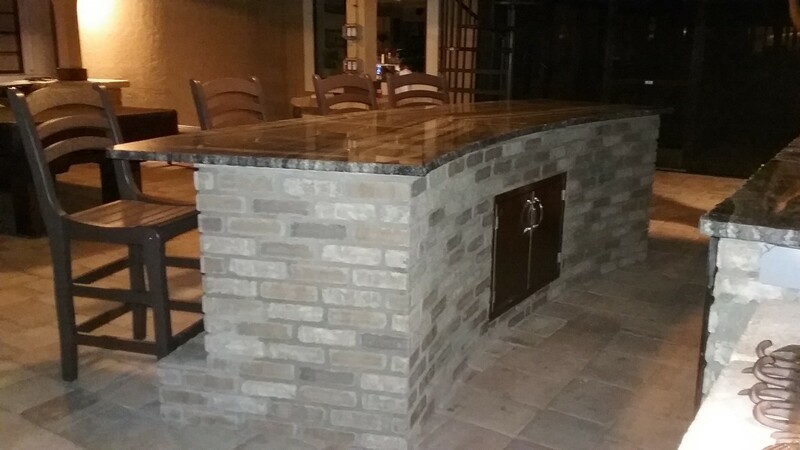 We designed and installed a rounded bar with a foot rest, level 5 granite and a custom brick facade. 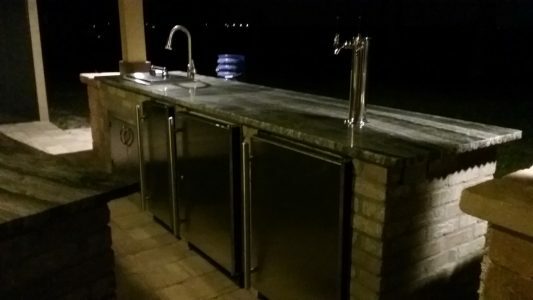 The bar itself has a Lion drop-in ice sink, Uline Icemaker, Uline Fridge, and a Uline Double Tap Kegerator all built in. This project in Naples features a Summerset Alturi grill, custom tiled backsplash and Summerset doors/drawers. 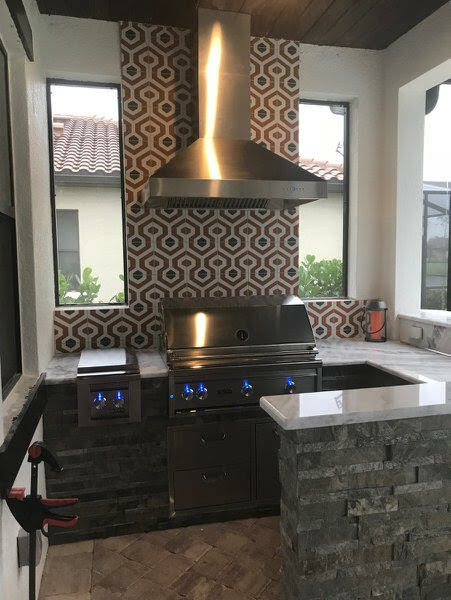 These Estero homeowners requested a hood vent which required a custom extension, a Summerset TRL grill and Summerset doors/drawers. 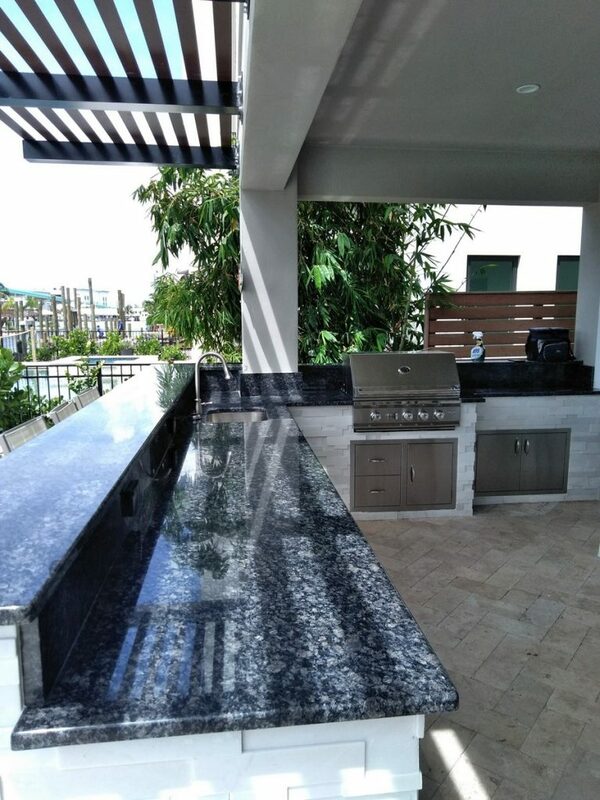 We created a sleek, modern design for their dream outdoor kitchen.